Celebrate Your Birthday with the Coolest Party in Town! Have your birthday party at the ice rink! Parties include tent area with tables, chairs, food package* and a party host to greet and assist your party. All parties are held during public skating hours. Non-skaters are welcome to join the party at no charge. Also be sure to ask about our VIP Private tent area or our enhanced catering menu including Kosher and Vegetarian options. Please note: There are no refunds. Parties are final once booked and no refunds are given due to weather conditions. * If weather does prevent the rink from safely operating, the party will be rescheduled. No exceptions. Want to schedule additional time for a Group Lesson during your party? 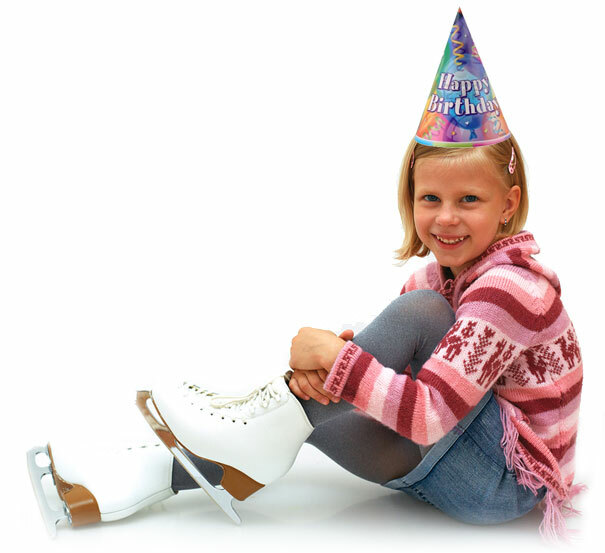 Professional instructors who offer private lessons at the rink on an individual or group basis are available for an additional charge during your party. *If rink closes due to severe weather conditions all parties will be rescheduled or refunded. **Food Package includes: pizza and beverages for up to 10 guests.